There are lots of kitchen utensils you can use to make sushi. Often these utensils are very handy. But the thing is: you don’t really need most of them. Not really. A pan to cook rice, a cutting board, a sharp knife, a bowl, if you have those you have the most basic set of tools to make sushi. But … most of the kitchen utensils described here do make life as a sushi chef a lot easier! And some of those tools allow you to do things you almost cannot do without them. That’s why Chef Devaux recommends you acquire at least the following items. Then you will have covered the basics. Just add ingredients and you’re good to go! You already know all about that if you have checked lesson 3. If you haven’t, do it now. Because a decent sushi knife is perhaps the single most important item in your sushi tool kit. A large, firm cutting board gives you space to work on. Just make sure it’s wood, since plastic or other materials will dull your knife. Cutting boards are usually widely available. Nevertheless, if you can’t one, click here to order a wooden cutting board. A simple bamboo rolling mat makes rolling the rolls so much easier. Usually the size is 25 cm x 25 cm. There are two kinds: one with thin bamboo strips and one with thick bamboo strips. The thin mat is great for making makizushi, the thick mat is considered to be more versatile. Chef Devaux uses rolling mats all the time and so should you. For best results cover the mat with a zip-lock plastic bag. This will prevent rice sticking to the bamboo. It will also make it easier to clean the mat. Bamboo rolling mats should be throughly air-dried after cleaning, to avoid growth of bacteria and fungi. If you can’t find them in your local store, click here to order a bamboo rolling mat. Alternatively you can consider buying a silicone sushi mat. Easier to clean than a bamboo mat and more hygienic, but Chef Devaux does not really recommend using silicon. It just feels strange to use, and it definitely doesn’t have that authentic look. Place the rolling mat in a zip-lock bag to prevent rice sticking to the bamboo. If you can’t find them in your local store, click here to order zip-lock plastic bags. If you don’t want to use plastic, there are alternatives. Several companies sell biodegradable zip-lock bags. Just like the plastic bags, they prevent rice sticking to the rolling mat. But they are much better for the environment. The downside is that most plastic free alternatives are a bit more expensive. You can also opt for reusable zip-lock bags. Like all these alternatives, they resemble plastic bags, but without the plastic. Basically used to help shape rolls without having to touch everything with your fingers. Applying pressure to a roll is much easier and more hygienic when you use cling film. For your information: cling film is very, very thin plastic. The majority of brands for household use have a thickness of 8 to 10 microns. A micron is a millionth part of a meter, or 0.001 millimiter, so rest assured that’s pretty thin. Just so you know: cling film is safe to use as long as you don’t use it where it might melt, e.g. in the oven or the microwave. Be aware that cling film can’t be recycled. Luckily there is an alternative available: natural cellophane. (Synthetic cellophane is also made of plastic). The downside: it’s more expensive. Chef Devaux recommends you try it if you can afford it. At least it’ll make you feel good not adding to the plastic pollution of our planet! Everybody knows what a teaspoon is, right? Do you also know that a teaspoon in recipes is primarily a means to measure quantities. 1 teaspoon equals approximately 5 gram. This approximately equals 5 mililiter. When using teaspoon quantities, the exact amount does’t really matter. Meaning that for instance 4.5 gram or 5.5 gram usually is also okay. When it’s important to use the exact quantity, in recipes ususally gram or milliliter (ml) is used . Having a measuring teaspoon among your utensils is pretty handy. You can order a quality measuring teaspoon here. Just like with teaspoon, tablespoon in recipes refers to a certain quantity. 1 tablespoon is approximately 15 gram or 15 milliliter. When a recipe mentions tablespoon, usually the exact amount does’t really matter, as long as you more or less get it right. Most Westerners are used to eating with a fork. Traditionally sushi is eaten with your fingers or with chop sticks. But that’s not an obligation. If you don’t want to use your fingers or can’t get the hang of using chop sticks, there’s no shame in using a fork. What matters is that you enjoy your sushi while not spilling it all over the table. A fork can also be handy for preparing sushi. Chef Devaux recommends you use a wooden or bamboo fork, although a metal fork is also fine. Traditionally chop sticks are used for eating. It takes some practicing to properly use them, but once you get the hang of it, you’ll look pretty cool. For eating Chef Devaux recommends bamboo chop sticks. Did you know there are also metal cooking chop sticks? Well, there are, and they are great to use for picking up food from a deep fryer. Don’t worry, the handle is made of wood so you don’t get burned. Order a pair of metal cooking chop sticks here. 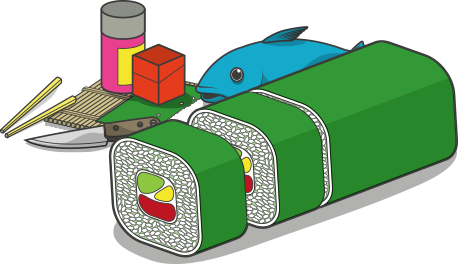 Despite popular belief, sushi is not all about raw fish. A lot of the ingredient requiere frying. Any old frying pan will do, although a non-stick frying pan is advisable. Chances are you have one or more frying pans already available. But just in case you needed a new one anyway, click here to order a brand new non stick frying pan. There are many more items you could use for making sushi, but if you are in possession of the above items, you’ve got all the basic utensils you need for making great sushi. Another time Chef Devaux will tell you all about a number of nice to have items for your sushi kitchen setup.